Colorados new health exchange will cost an estimated $22 million to $26 million a year starting in 2015, spurring managers to consider advertising, taxes on insurance companies or fees charged to employers and consumers using the exchange to pay for it. The U.S. Department of Health and Human Services formally approved Colorados exchange on Monday, making the state one of the first six in the country to approved to open for enrollment next October. Other states that will use a federally-run health exchange will pay fees of about 3.5 percent on the premiums that each person pays per month. Colorados managers arent certain theyll charge user fees because they dont want health insurance costs to go up when people are already struggling to pay for insurance. Managers here pledged that they will keep costs lower than those the federal exchange will charge. Health exchange board members have not yet voted on how to pay for Colorados exchange and some funding proposals would require legislative approval. Colorado is one of 18 states building its own health exchange. 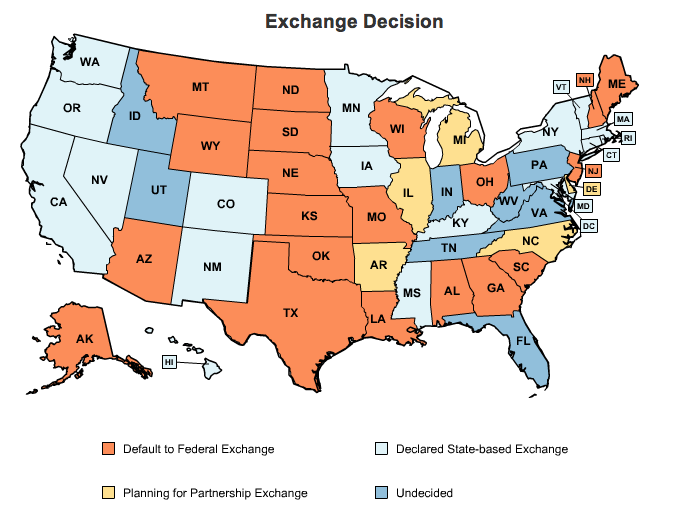 Twenty states will use the federal exchange; five are partnering with other states; and eight states remain undecided. Colorado cant directly tap state or federal funds to pay for its exchange, but managers are considering a tax on health insurance providers to help fund the exchange at least from 2015 to 2018. Insurance executives say any fees charged to them will simply filter down to consumers and businesses. Currently insurers that provide health policies to individuals and small businesses pay fees that total about $40 million a year to help fund Cover Colorado, the high-risk insurance program for people who cant otherwise get coverage. Colorados health exchange managers want to consider new legislation that would allow about $20 million a year from Cover Colorado to help pay for the exchange. They would also tap about $5 million a year from health insurance premium tax credits that also help fund Cover Colorado. Under the Affordable Car Act, starting in 2014, insurance companies can no longer deny coverage to people with pre-existing conditions, so state-run high-risk pools will end. At that time, the federal government will give people with high health costs subsidies to help cover their care and they will be expected to find insurance through the health exchange. Beth Soberg, CEO and executive director of UnitedHealthcare of Colorado, left, and Steve ErkenBrack, president of Rocky Mountain Health Care, are both board members for Colorados health exchange. Soberg warned Monday about perceptions of double-dipping. While some board members liked the idea of combining advertising earnings with funds from Colorados high-risk pool to help pay for the exchange in its first years, one board member warned about perceptions. I like the balanced approach, said Beth Soberg, CEO of UnitedHealthcare in Colorado. But, she said, if consumers and health insurance companies anticipated that federal funds would cover high-risk care, they might not want to continue paying at the state level for that care, even if those funds help stabilize the exchange for everyone. This will be seen as double-dipping, Soberg said. And in some ways, thats what it is. Health exchange officials say they plan to run a lean operation that wont cost nearly as much as health exchange operators plan to spend in other states. Colorado has had a very conservative approach to the exchange regarding staffing and services wherease with some other states, theres a lot more interoperability with other state services, Blais said. In contrast, Blais said Colorado wanted as much flexibility to cut costs down the road. For instance, she said Colorado officials shopped around for discounted technology services and plan to reduce costs in the future by sharing services with other states. Fontneau said other states with comparable or smaller populations plan to spend more to run their health exchanges. For instance, Maryland, with a population of 5.8 million, compared to Colorados 5.1 million, plans to spend between $38 million and $51 million a year. Minnesota, which has 5.3 million people has projected costs of $54 million a year, and Oregon (population 3.8 million) plans to spend $34 million. Colorados new health insurance marketplace will go online late next year with plans that will start covering people on Jan. 1, 2014. Currently federal grants totaling $62 million are funding start-up costs here. Colorado managers can apply for additional funds to pay for the first year, but by the beginning of 2015, Colorados exchange must pay for itself. And any revenues the state earns in 2014 would cancel out federal funds for that year, leaving managers with a temporary challenge. That creates a bit of a fiscal cliff for us, said Cammie Blais, chief financial officer for Colorados health exchange. At the end of 2014, we would potentially have no cash reserves. Blais and Health Exchange CEO and Executive Director Patty Fontneau gave a presentation to Colorados 12-member exchange board on Monday. They outlined projected costs for Colorados exchange and recommended sources of income. The largest chunk of cash would come from funds now used to pay for Cover Colorado. Exchange managers will also consider advertising or taking a cut from the sales of related items, such as dental or vision care. We would not be advertising shoes or makeup. We would establish guiding principles to make sure what were doing is appropriate, Fontneau said. She and others say they also plan to contact foundations for support of outreach programs. As part of the health exchange, navigators will provide in-person support for people as they try to figure out what health insurance plans to buy. Regardless of how board members decide to pay for Colorados health exchange, they dont want costs to be so high that the only people who buy on the exchange are extremely sick people who cant get insurance any place else. We dont want adverse selection where a policy would cost more in the exchange than outside the exchange, Fontneau said. 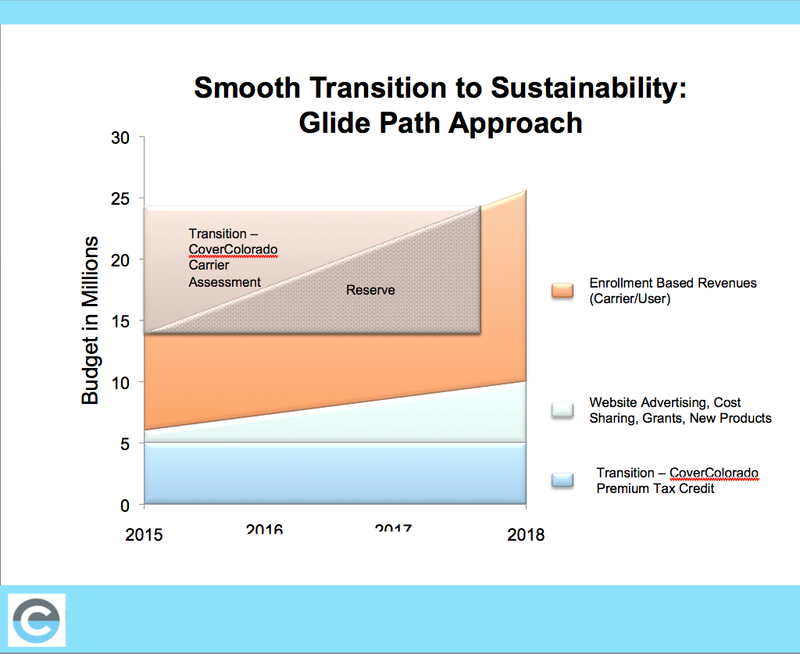 Rather, Fontneau and Blais said they want a smooth transition that evolves into long-term sustainability. We want to strive to have multiple revenue streams which will provide stability for us, Blais said. We are constantly talking about cost reductions and talking to other states so we can save money.